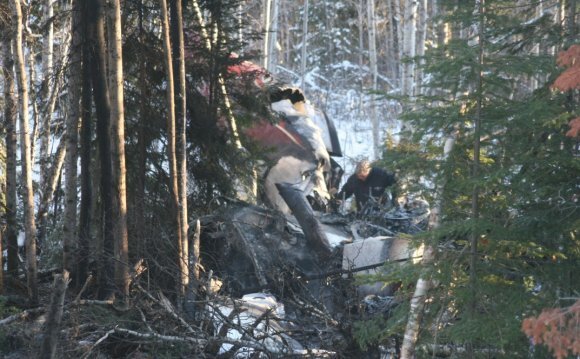 The mayor of Red Lake says his town is devastated by the plane crash that killed five people there Sunday night. Phil Vinet said Red Lake is a hub for air travel and, when something like this occurs, it affects the whole community. "This isn't a very large community. There's 4, 500 of us, " he said "We all have heavy hearts today. Very heavy." Vinet said he's seen aviation incidents in Red Lake before, but nothing of this magnitude. 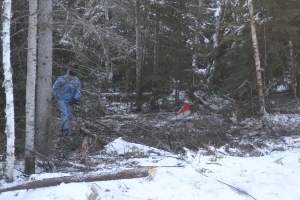 Two people survived the crash of the Bearskin Airlines twin-engine turboprop, about 500 kilometres northwest of Thunder Bay, just after 6:30 p.m. local time Sunday. The plane crashed on approach to the Red Lake airport and burst into flames. The two pilots were among those killed, said Ontario Provincial Police Sgt. Rob McDonough at the provincial police communications centre in Thunder Bay — a 25-year-old from Mississauga and a 34-year old from Winnipeg. The three passengers killed include a 53-year-old woman, a 53-year-old male, and a 64-year-old woman, all of whom hail from Red Lake. Their bodies were located within the wreckage. Provincial police issued a release early Monday saying the names of the deceased would be released after their next of kin were notified. The survivors were identified as a 29-year-old man and a 50-year-old woman, both from Winnipeg. "The one male was actually the one that called us to report the crash. He was able to pull the woman out of the wreckage prior to it becoming fully engulfed in flames, " McDonough said. The two were taken by ambulance to hospital. McDonough said they were treated for non-life-threatening injuries. He noted the man was able to walk to the ambulance, while the woman appeared to have suffered a back injury. 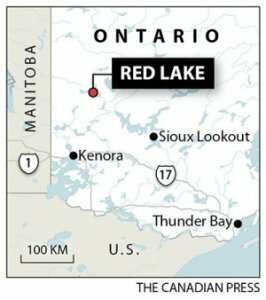 The plane had taken off from Sioux Lookout, Ont., on a flight to Red Lake, 270 kilometres north of Kenora, and about 100 kilometres east of the Manitoba boundary. McDonough said the 19-passenger aircraft knocked down some hydro lines during the crash. "The plane was totally destroyed by the flames, " he said. "Upon impact, it burst into flames and then set bush around it on fire as well." A local fire crew quickly doused the flames in both the plane and the woods, he added. There's no word yet on the cause of the crash, but McDonough said Transportation Safety Board investigators from Winnipeg were expected to arrive at the site Monday afternoon. Once they arrive, investigators will examine "all aspects of the aircraft, " including the structure, controls, engines, propeller and landing gear, to see if "any of it could be related to the accident that happened, " said TSB spokesman Peter Hildebrand. There were light clouds and moderate winds out of the northwest around the time of the crash, as well as some snow showers, "but not anything severe in terms of this time of year, " he said. Terry Harapiak, owner of the Esso station in Red Lake, said that right around the time of the crash, the weather turned ugly, with flurries and strong winds. Bearskin Airlines is based in Sioux Lookout and has operated since 1963, employing 300 in Ontario and Manitoba. Ron Hell, director of marketing and sales for Bearskin, said they are still confirming details of the crash and expect to release more information later. "At this time our thoughts, and our prayers and our condolences go out to all the families involved and we just ask everyone to also give your thoughts and prayers to those involved, " he said. He added that all Bearskin flights will be operating as scheduled Monday. Bearskin's fleet of 16 Metro Fairchild planes serve 18 destinations in the two provinces. Transport Minister Lisa Raitt expressed her condolences on Twitter. "My thoughts and prayers go out to all those affected by the tragic air accident near Red Lake last evening. Thank you to first responders, " she wrote. In May 1995, a Bearskin aircraft collided with a Piper Navajo near the Sioux Lookout airport, killing all eight people aboard the two planes.